Disenfranchisement, simply put, is “the taking away [of] the right to vote in public elections from a citizen or class of citizens.” Throughout the world, people who have committed crimes that carry the weight of jail time or felony convictions are disposed of their right and ability to freely vote. Different levels of disenfranchisement occur, including 1) only during prison time, 2) during prison and parole, 3) during prison, parole and probation, and 4) prison, parole, probation, and post-sentence (which also has its own variations ranging from only after the second offense, to a 5 year waiting period, or full disenfranchisement after a felony conviction). 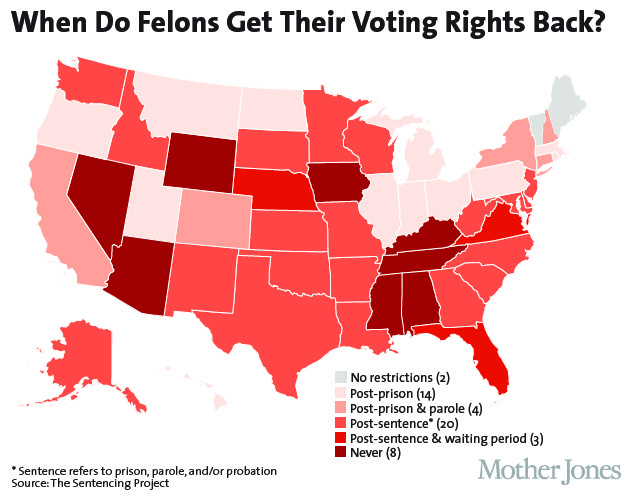 Yet, in the United States alone, 5.85 million are denied the right to vote due to felony disenfranchisement laws. Each state has the ability to direct and control the voter rights’ laws that allow for disenfranchisement, intentionally restricting the voter rights of those who have been convicted of felonies, which bars prisoners from voting in both state and federal elections. Out of the fifty states, however, only three states permanently disenfranchise felons – Iowa, Florida and Kentucky, alternatively, two states allow for everyone to vote, despite criminal records – Maine and Vermont. 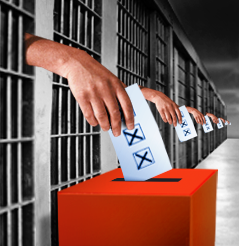 In a study conducted of over 45 countries, accounting for the major countries in Europe, North America, Asia, South America, and Australia, almost half of the countries allow for felons to vote despite their prison conviction. The restrictions imposed by countries are vast. For example, the majority of Eastern Europe allows for either full voting rights or impose selective restrictions [Bosnia (selective restrictions), Croatia, Czech Republic, Macedonia, Poland (selective restrictions), Romania (selective restrictions), Serbia, Slovenia, and Ukraine]. Other Eastern European countries such as Bulgaria, Hungary, and Russia only have a voting ban on felons during their prison time. The only one that had a full ban on voting rights for felons during prison and post-conviction was Armenia. Given many of these countries human rights records in other areas, this is a surprising right that is guaranteed. In contrast, the United Kingdom continues to incorporate prisoner disenfranchisement into its laws, despite a ruling by the European Court of Human Rights in Hirst v. United Kingdom (No. 2), stating that the blanket ban on prisoner voting was unreasonable. However, the United Kingdom does allow those who are only civil prisoners or on remand un-sentenced to vote. There was a bill introduced in 2012 and put into law in 2014, the Convicted Prisoners Voting Bill that limits the scope of disenfranchisement to those who are serving a custodial sentence. Other countries that allowed a full vote included Canada, Austria, Denmark, Finland, Ireland, Israel, Latvia, Lithuania, Norway, Spain, South Africa, Sweden and Switzerland. Countries that follow selective restriction on voting rights include Germany (which only takes away rights on rare, court-mandated instances), Iceland (if the felony is for a prison term longer than four years), Australia, France, Greece, Italy, Luxembourg, Malta, and Portugal. The only countries that have full disenfranchisement laws for post-conviction felons include Belgium (if a sentence is longer than seven years), Armenia, Chile and in some instances, the United States (on a state-by-state basis). Some groups such as the American Civil Liberties Union and The Sentencing Project have started movements in places such as the United States, to recognize that all people should have a right to vote under both domestic law and international law as evidenced by the Constitution and treaties such as the ICCPR. Prison was created not only as a punishment, but also as a way to rehabilitate those who have broken the law. In the case of rehabilitation, we should work towards the idea that we want those who have broken the law to not only learn from their mistakes and move forward but also to one day reintegrate themselves into society as productive citizens. When stripping them of such a simple, inherent right to be a part of the democratic process that governs them, how do we expect them to reach this goal? Former prisoner in the United Kingdom, Caspar Walsh, writes about how disenfranchisement inhibits the ability of prisoners to rehabilitate and causes a disconnect between those behind bars and politicians creating the laws that control everyone’s lives. The Sentencing Project published a debate over the topic, “Should Ex-felons be Allowed to Vote?” between Roger Clegg and Marc Mauer. Mauer cites an Israeli Supreme Court case, discussing the right of felons to vote because “society must ‘separate contempt for his act from respect for his right’.” With the amount of people in prisons worldwide, the disenfranchised could have serious effects on elections if they were able to freely vote despite their imprisoned status. To view further debate on whether or not prisoners should be allowed to vote, more information can be found at 1) Duel: Should Prisoners be able to vote? or 2) Why Can’t Felons Vote? Statute of the International Court of Justice, art. 38, para. 1 (defines the customary international law as “general practice accepted as law”); International Convention on Civil and Political Rights, opened for signature Dec. 16, 1966, 999 U.N.T.S. 171 (entered into force Mar. 23, 1976) (168 countries are parties to the Covenant, evidencing a general practice accepted as law) [hereinafter ICCPR]. General Comment Adopted by the Human Rights Committee under Article 40, Paragraph 4, of the ICCPR, CCPR/C/21/Rev.1/Add.7, August 27, 1996, Annex V, para. 4 (examples of “objective and reasonable” include setting age limits for voting or denying the right due to established mental incapacity). International Comparison of Felon Voting Laws, ProCon.org (May 27, 2014), http://felonvoting.procon.org/view.resource.php?resourceID=289. Convicts ‘will not all get vote’, BBC News, Oct. 6, 2005, http://news.bbc.co.uk/2/hi/uk_news/4315348.stm; Mark Tran, UK Prisoners Denied the Vote Should not be Compensated, ECHR Rules, The Guardian, Aug. 12, 2014, http://www.theguardian.com/politics/2014/aug/12/uk-prisoners-denied-vote-no-compensation-european-court-of-human-rights. Convicted Prisoners Voting Bill, 2014-5, H.C. Bill 50 (U.K.), available at http://www.publications.parliament.uk/pa/bills/cbill/2014-2015/0050/15050.pdf. 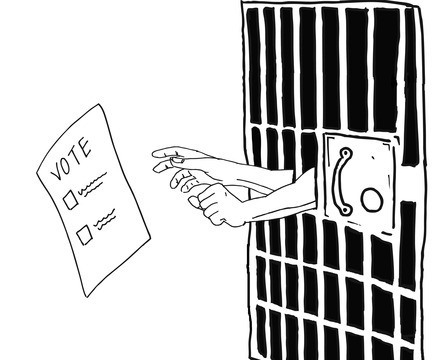 Caspar Walsh, Why Prisoners Should be Given the Right to Vote, The Guardian, June 5, 2012, http://www.theguardian.com/society/2012/jun/05/prisoners-right-to-vote. Roger Clegg & Marc Mauer, Should Ex-Felons be Allowed to Vote?, Sentencing Project, Nov. 1, 2004 available at http://www.sentencingproject.org/doc/File/FVR/fd_legalaffairsdebate.pdf. Shami Chakrabarti & Dominic Raab, Duel: Should Prisoners be able to vote?, Prospect, Aug. 20, 2014, http://www.prospectmagazine.co.uk/regulars/duel-should-prisoners-be-able-to-vote; Reynolds Holding, Why can’t Felons vote?, Time, Nov. 1, 2006, http://content.time.com/time/nation/article/0,8599,1553510,00.html. Categories: comparative law, foreign law | Tags: Center for International and Comparative Law, comparative law, human rights, prisoner voting rights, right to vote, voting | Permalink.